In the midst of our summer adventures or lulls, the P&W is bringing you a special summer events edition, commemorating the 50 anniversary of Freedom Summer, the “long, hot summer” that is a crucial part of our state and nation’s civil rights history. 1964 was a big year, both of progress and of terrible violence. Notable events included the creation of Freedom Schools, the murder of the three civil rights workers in Philadelphia in Neshoba County, and the Mississippi Freedom Party (MFDP) delegates attending the national Democratic convention in Atlantic City. This summer, our capital city of Jackson is hosting numerous cultural and historical events commemorating the legacy of those tumultuous times, and we are here to bring you a complete guide to the exhibits, lectures, and events happening. First, some basics for those of us (like me) who were previously unaware of the history of the Freedom Summer. What was the Freedom Summer? The Freedom Summer was the summer of 1964, dubbed for Robert Moses and the Student Nonviolent Coordinating Committee’s (SNCC) Freedom Summer Project, a drive to register African American voters across Mississippi. Coordinated alongside the National Association for the Advancement of Colored People (NAACP), and Congress of Racial Equality (CORE), the campaign paired about 1000 primarily white college students from Northern and Midwestern states with black activist organizers throughout Mississippi. The CORE website states only 6.7 percent of African Americans in Mississippi were registered to vote as of 1964, reflecting a shockingly unequal system of racial disenfranchisement. The drive and volunteers were trained in nonviolent resistance but the summer was not without violence and tension from segregationists, as marked early on by the murders in Neshoba County. The volunteers also set up Freedom Schools for the education of African Americans. As such, the summer affected many areas of African American agency in the fields of education, voting, and political representation, and provided further momentum to the civil rights cause. Even if you are not a history buff, we all need historical consciousness, especially in a state with as checkered a past as our own. These events commemorate landmark Civil Rights events, putting Mississippi, and Jackson, in the national spotlight. It is a case of living history in our own city, and these events allow us to place civil rights textbook history into context. It is necessary to mark this 50 anniversary to not only see how far we have come but to continue forward. Above is only a brief overview, each event and exhibit delves more into details and different aspects of the summer. The concentration of events are fast-approaching towards the middle and end of June. So if you happen to be in and around Jackson, opportunities for remembrance and education abound. From lectures to festivals and exhibits, here is your exhaustive guide to the Freedom of Summer events, the asterisk (*) marks our best bets and must-sees. Many exhibits will be open the duration of the summer, and most events are free or at low cost. Where: Mississippi Museum of Art, 380 S. Lamar St.
Explores the activist photography of those working with agencies such as SNCC and CORE, this show gives a glimpse into the grassroots movements that marked the Civil Rights Era. The exhibit includes many photographs of events listed above: Freedom Schools and voter registration, the Democratic national convention, and reactions to the 1964 Philadelphia murders. The power of these images makes this exhibit a can’t miss. If you need more persuasion, click here for the P&W’s previous coverage. Mississippi Department of Archives and History (MDAH), 200 North St.
Where the other exhibits commemorate, this exhibit engages by recreating and placing us in the Freedom Summer. The exhibit includes a façade and replication of a Freedom School classroom, alongside striking photographs, artifacts, and an original documentary from the archive’s growing collection for the in-the-works civil rights museum. This exhibit even received national media attention recently via NPR’s Code Switch blog, who saw this official recognition of our “rich but chilling history” as the state “now actively promoting its place as ground zero in the civil rights struggle”. The exhibit is open Monday through Friday 8 a.m.—5 p.m., Saturday 8 a.m.—1 p.m. and admission is free. Most of us would recognize Norman Rockwell’s work: iconic scenes of the post war American Dream, Thanksgiving turkeys and children in ice cream parlors. This show is a marked difference. 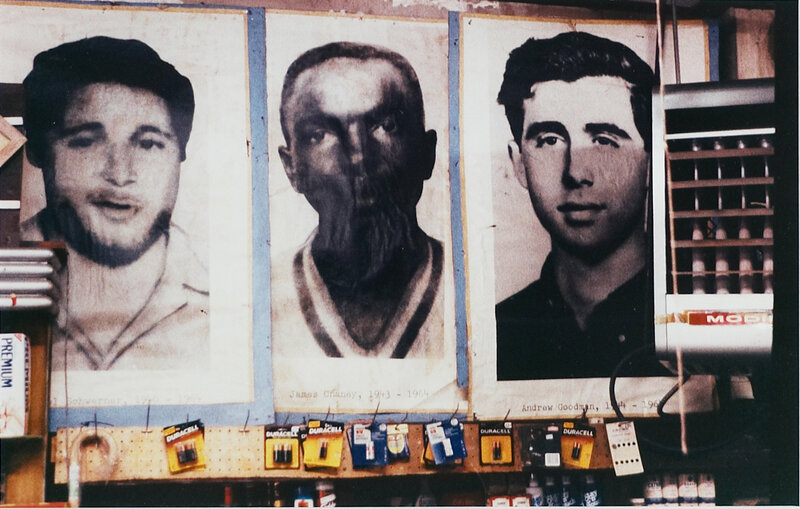 Following the June 21, 1964 murders of three civil rights activists mentioned earlier, James Chaney, Michael Schwermer, and Andrew Goodman, LOOK magazine ran an investigative piece. Norman Rockwell provided the cover illustration, and this exhibit is complete with his preliminary work alongside the completed painting. The exhibit is on view from June 14 through August 31. Cost of admission is $10 adults, $8 seniors, $5 students—though price also includes admission to This Light of Ours and vice-versa. Likewise, the free student admission day applies as well. Accompanying the other two exhibits, and especially complementing the Rockwell show, Icons of Freedom commemorates the heroes, victims, and volunteers of the Civil Rights movement, including the three activists killed in Philadelphia, Medgar and Myrlie Evers, and Martin Luther King, Jr. among more. The exhibit is on view through August 3 in the William B. and Isabel R. McCarty Foundation Gallery, and admission is free. Smith Robertson Museum and Cultural Center, 528 Bloom St. The Smith Robertson Museum and Cultural Center resides on an unassuming corner of downtown in what was once the historical African American Smith Robertson school and is now a center for African American heritage, history, and expression. The exhibit “And the Children Shall Lead Them” focuses on the children of the 1960s Civil Rights movements, featuring large cut-outs. Opening reception of exhibit: Monday, June 23, 9 a.m. to 5 p.m. Cost is $4.50, $3 seniors. The museum is also host to an exhibit Women of the Movement, which profiles many of the strong female leaders during the Civil Rights movement who often are overshadowed. In addition, the museum houses a Medgar Evers exhibition as part of their permanent collection. When: Sunday, June 22, 3 p.m. The author of American Mirror: The Art and Life of Norman Rockwell will give a talk to accompany the Murder in Mississippi show and discuss the famous American artist’s portrayal of the Civil Rights movement. This talk is especially for any of you interested in Norman Rockwell and/or national media coverage of Mississippi. Book signing to follow. When: Monday, June 23, 6 p.m.-11 p.m. Following the opening ceremony of the “And the Children Shall Lead Them Show”, the Smith Robertson Museum will host a block party outside on Bloom Street with activities and community building for all. When: Wednesday, June 25, 6 p.m.-8 p.m. The Montage Dance Company will perform a choreographed dance inspired by the activists of the Freedom Summer and the Civil Rights movement. Seating is limited, so arrive early, and a reception follows the performance. When: Thursday, June 26, 8 p.m.-11 p.m.
A musical event in the museum’s art garden provides one of the more accessible Freedom Summer events, as local artists transport us to the soundtrack of 1964, performing now iconic songs from The Beatles, Sam Cooke, and more, as well as performing Freedom Songs. When: Thursday, June 26, 8:30 p.m. When: Saturday, June 28, 7 p.m.
Where: Sneaky Beans, 2914 N. State St. Gather around the outdoor stage at Sneaky Beans for a concert arranged by OurGlass Media and Freedom Summer Youth Congress and Freedom Fest featuring no less than 8 hip hope performers, ranging from Jackson local favorites such as James Crow and 5th Child, to artists touring from Atlanta and Oakland. Performers include CASUAL of the Hieroglyphics, Mr. Franklin aka Kamikaze, Quanstar, DLabrie, Silas Trey P. Stapleton, ThecaJones, and Mr. Fluid and DJ 360 Degrees. Doors open at 6 p.m. When: Sunday, June 29th, 3 p.m. The second lecture in the series features three panelists who participated in the Civil Rights era discussing how the era influenced and affected American art. Where the first lecture is focused specifically on Norman Rockwell, this panel’s discussion will range over art created in response to the era’s turmoil. Mississippi Public Broadcasting is also participating in commemorating the Freedom Summer by producing a series of 53 one minute Public Service Announcements airing June 9 through August 28. The PSAs feature interviews with civil rights activists, and cover many of the big events of the summer of 1964. The coverage will conclude with a full length documentary, “1964: The Fight for a Right” which will air at 7 p.m. You can access the PSAs here. The conference is perhaps the penultimate event commemorating the Freedom Summer, and provides the most focus for moving forward. Sponsored by Mississippi Veterans of the Civil Rights Movement, Mississippi State Conference NAACP, and Tougaloo College. If you cannot attend the conference but want to know more about the Freedom Summer and the conference’s topics, Tougaloo College has put together an informative PDF about the Freedom Summer here. Want to know more about the man behind it all, Dr. Robert P. Moses? Check out the Jackson Free Press’ profile here. Colorlines is doing a month long coverage throughout June of conversations with particpants of the Freedom Summer, starting with this article featuring Zellie Orr, a black student who was 13 that summer. If you’re wanting to prepare for the Museum of Art’s Soundtrack event, or want to build your own 1964 Summer soundtrack, the folks over at The Root have you covered. John Lewis, Civil Rights activists, ruminates on his experience fighting segregation in a quest for an education, and urges the importance of “necessary trouble”.